* Annual estimated passenger usage based on sales of tickets in stated financial year(s) which end or originate at Cardiff Queen Street from Office of Rail and Road statistics. Methodology may vary year on year. Cardiff Queen Street railway station (Welsh: Caerdydd Heol y Frenhines) is a railway station serving the north and east of Central Cardiff, Wales. 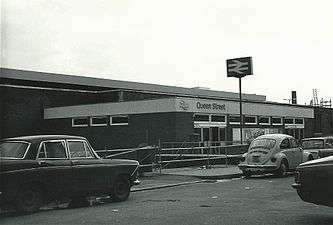 It is the second busiest railway station in Wales, being located near Queen Street. It is one of 20 stations in the city and two in the city centre, the other being Cardiff Central. The station is staffed at most times, with a ticket office and machines, and a café on platforms 3 and 4. A newsagent is situated opposite the station. In 2014, a reconstruction of the station was completed in order to reduce bottlenecks, with two extra platforms being put in (a previously existing platform, opposite platform 4, and a new bay platform next to platform 2 for the line to Cardiff Bay), taking the total number of platforms to 5. A station known as "Crockherbtown" on this site was built in 1840 by the Taff Vale Railway, whose headquarters were also located here. It was rebuilt and given its present name in 1887. Other major rebuildings took place in 1907 and by British Rail in 1973. The latter project saw the station's overall roof removed, the original Taff Vale station frontage demolished & replaced and the western side platform closed, with all through traffic concentrated on the central island. In 2005, the station was fitted with new ticket gates, operational when the station is manned, which allow easier access in both directions. In 2006 LED screens replaced the old information display monitors. The old station car park is now dedicated for private use by residents of a nearby modern development of apartments known as "The Aspect". Queen Street is the main hub of the Valley Lines network – a railway system serving Cardiff, the Vale of Glamorgan, Bridgend and the South Wales Valleys – and has the solitary connection to Cardiff Bay. The station is located at the eastern end of the city centre, near the Capitol Centre as well as St David's Centre, and sees heavy volumes of commuter rail traffic during the rush hour. Platform 5 is used for services to Rhondda Cynon Taff (Aberdare, Merthyr Tydfil and Treherbert). Platform 4 is used for services to Rhymney and Bargoed as well as Coryton in north-west Cardiff. Platform 3 is used for services towards Cardiff Central and onwards to Barry Island and Bridgend via Rhoose Cardiff International Airport. Platform 2 is used for services towards Cardiff Central and onwards to Penarth and Radyr via City Line. Platform 1 is now only used for services to Cardiff Bay, which operate every 12 minutes. Queen Street station in 2015, looking north. The new Cardiff Bay shuttle platform 1 is on the extreme right. and the new platform 5 is on the far left. As part of a £200m regeneration scheme to boost train capacity in Cardiff and the surrounding areas, Cardiff Central and Cardiff Queen Street stations are to be redeveloped from June 2014 and April 2013 respectively. The whole Cardiff Area Signalling Renewal project is due to be completed by May 2015, funded by the Department for Transport, Assembly Government and Network Rail. The Assembly Government has committed £7m for the enhancements programme. The stations will be similar in design, featuring slate panels, grey brickwork, pavilion-style roofs, large windows and stainless steel signage. Cardiff Central will have a new two-storey southern entrance and ticket hall under plans submitted by Network Rail. An eighth platform at Cardiff Central and a fourth and fifth at Cardiff Queen Street will be installed. Once finished, the number of trains running to the Valleys will increase from 12 per hour to 16 per hour. The new platforms have now been brought into use as of Sunday 14 December 2014. Platform 1 is the new bay platform for the Cardiff Bay shuttle, platform 2 is for City Line services to Radyr and trains to Penarth, Platform 3 is for trains to Barry Island and the Vale of Glamorgan line, Platform 4 is for trains to Coryton and Rhymney and the new Platform 5 is for trains to Treherbert, Aberdare and Merthyr Tydfil. In the Spring of 2016, the Roll of Honour off those who served the armed forces between 1914 and 1919 from the Taff Vale Railway was put on display in the Ticket Hall. Both the station and this very page feature prominently in the Torchwood audiobook Ghost Train. ↑ ...but the 1t/h travelling to Rhymney covers the exact same route, but continues for 4 more stops, so passengers travelling from Queen Street to Bargoed could get one of 4t/h. ↑ Hutton, John (2006). The Taff Vale Railway, vol. 1. Silver Link. ISBN 978-1-85794-249-1. ↑ "Network Rail South Wales Vallys Business Plan 2007" (PDF). Retrieved 2008-01-09.